Say hello to Lily! She can&apos;t wait to meet you! Large 18 inch Helium Balloon included. Lily is one of just 1,500 luxury collectable bears worldwide and she is made from Soft-Luxe material. The two-tone white and grey plush gives her a gentle appearance complimented by the other fine handcrafted details of her appearance. She is heavily weighted with beans and all of her joints (arms, legs, and head) are movable! 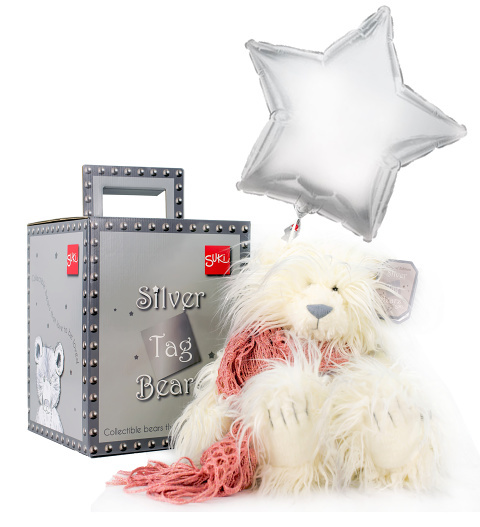 Each bear comes with a collectors box, gift wrapped in tissue paper and delivered with an 18&apos; Silver star balloon.